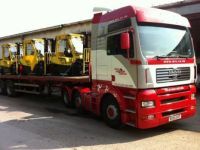 The trucks were supplied by Barloworld of Golborne, Warrington and adds the total to seven Hyster machines purchased in the last 18 months. Once again our logistics expertise was called upon to ship and deliver the Agricat 32 tonne tracked piling rig from Coventry to Ramsey on behalf of Island developer, Dandara Commercial. NATURAL gas is to be extended to 6,500 homes and businesses in the north, west and south of the Isle of Man. 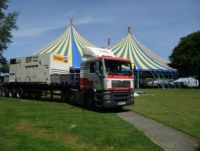 The giant tent, which will host the concerts, has arrived on the island on five trailers and 200 workers, cranes and forklifts were needed to erect it over a week. "We have worked with Manx Independent for the past twelve years to accomplish our deliveries to the Isle of Man. We have always found them to be professional in their approach and have always offered us an excellent service through proactive planning and communication." © 2019 Manx Independent Carriers. All Rights Reserved.